I am continuing my weekly teacup and saucer series "Tea Time" today with a bright yellow tea cup and saucer from Mayfair China, England. This Mayfair teacup has no exterior pattern. Just a beautiful little bouquet of pink and blue flowers to enjoy each time you take a sip of tea. This made in Japan figurine, the "yellow tambourine lady" complements the yellow teacup. The book "The Shell Seekers", by Rosamunde Pilcher was a recent purchase for $2 at a Friends of the Public Library sale. 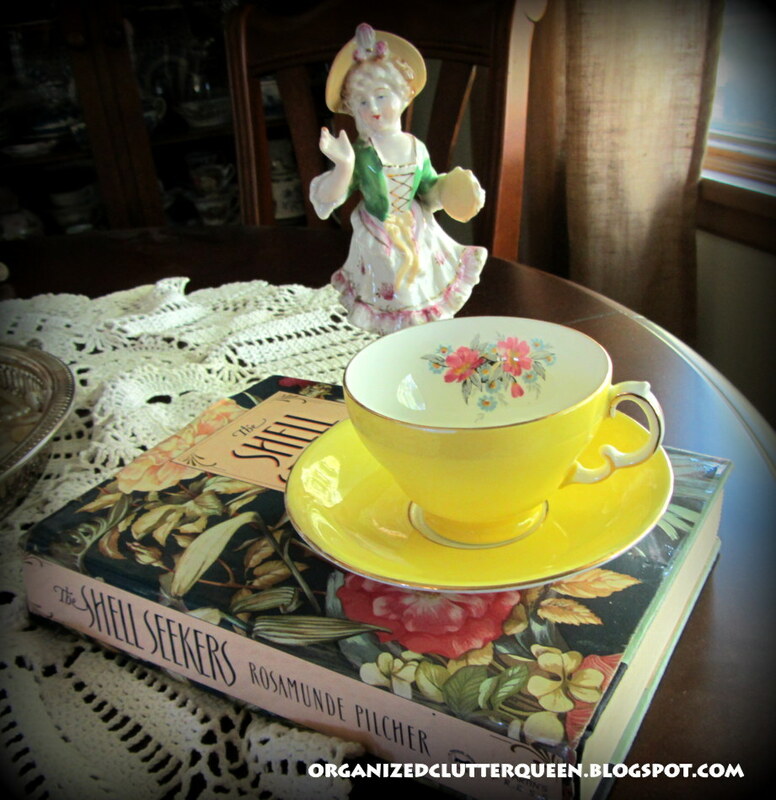 I added this teacup and saucer to my collection last month for $4. 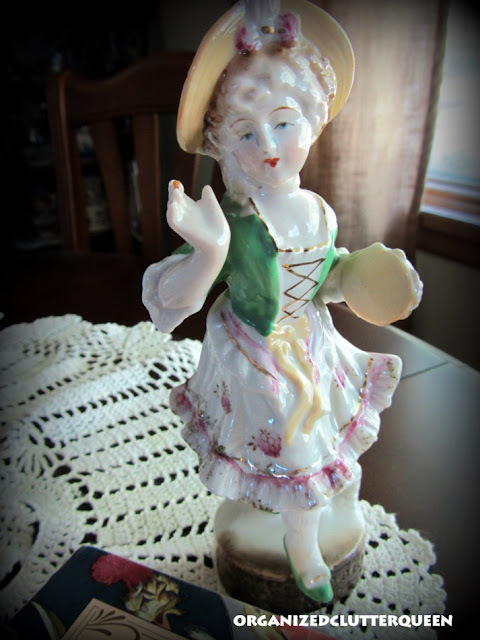 I walked by it a few days at the consignment shop, because it's not my usual taste in teacups, but I eventually had to give it a "good home". The yellow is just so pretty! For $4, how could you go wrong? Hi Carlene: That is a bright, beautiful little tea cup. The little nosegay inside is just right to give it a softer feel. Couldn't you set a very pretty tea table if you had a few of those same pieces, with a daffodil centerpiece in the spring?.Happy Sunday..Judy P.S. I love the new look. 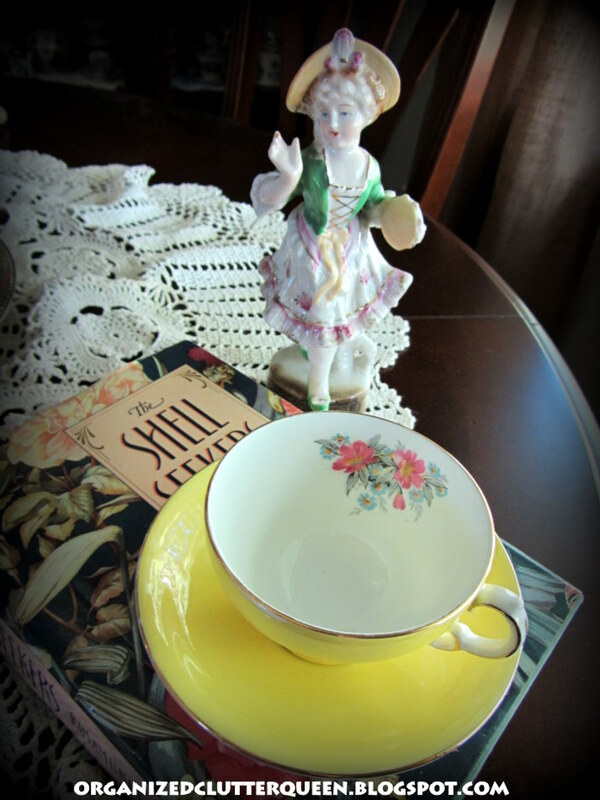 Very different this adorable yellow teacup and saucer and better yet, for just $4..she had go home with you! Love the small bouquet inside it too. Have a terrific week. It's beautiful Carlene, and so bright and cheerful JUST LIKE your little tambourine lady...AND I see you are about the journey into Rosamunde Pilchers world too. AHHH, Life is good! Yellow is my favorite color and I love it Carlene. Love your tea cup, but my eye was really caught by the book under it. I love Rosamunde Pilcher! As matter of fact I'm in the process of rereading Winter Solstice, just because I like how it takes me away - to a different place! Bright and cheery is that cup! I am not a fan of flowery tea cups but that one is just right! SO cute! This Tea cup is so bright and Beautiful it just makes you happy when you look at it, like a bright Sunny Day.. Your teacup has happy written all over it! The wee bouquet inside just makes it so cute. I read The Shell Seekers years ago. What could be better than a cup of tea and a good book? Thank you for joining me for tea today and enjoy your week. Beautiful teacup! I've never seen one with such a lovely bright yellow and the pretty flower inside. I'm glad you gave it a good home! I have nothing like this cup. It is so vibrantly yellow and cheerful looking! So she is a rescue cup! Lol! 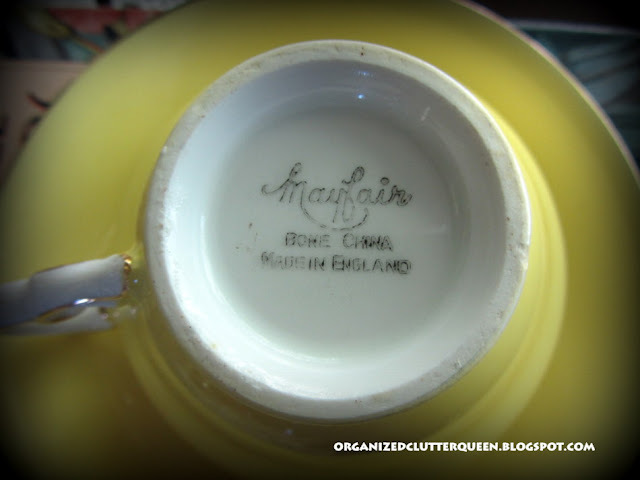 I think she is a sweet vintage Mayfair cup. I love how vibrant the yellow is, and her flowers are very retro too. Great find! 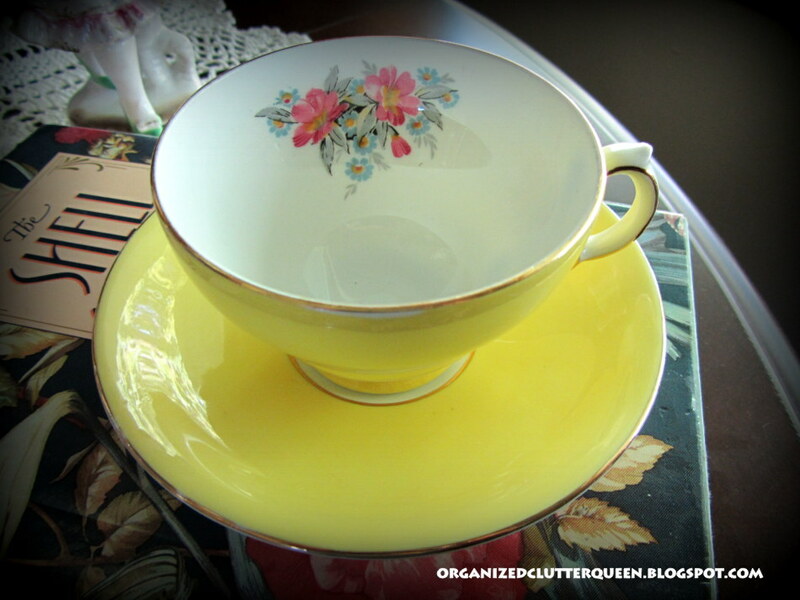 What a beautiful tea cup-- yellow is such a happy color. I love your figurine. She's so pretty and matches your tea cup quite well.